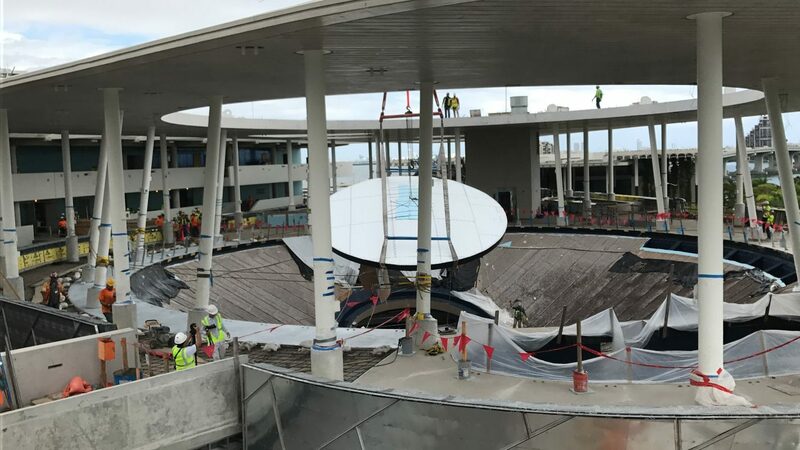 Last week we reached a major milestone in the completion of Frost Science—the installation of the gigantic oculus lens of the Gulf Stream Aquarium! The Gulf Stream Aquarium is a 100-foot wide, 500,000-gallon cone-shaped vessel with a corner-less design that allows open-water marine species such as tuna and sharks to swim continuously as they would in the actual Gulf Stream. The oculus lens serves as the massive viewing portal into the Gulf Stream Aquarium, the centerpiece of the museum’s three-level Aquarium. The 31-foot wide, 13.5-inch thick acrylic lens will put you underneath the action and offer stunning views of the beautiful creatures cruising overhead. The lens had a long journey, starting as a mere concept, going through creation, refinement, shipping and finally, installation at Frost Science by Skanska USA Building, the construction team leading the project, along with Hill International and Acrylic Tank Manufacturing. None of this was easy with an object that weighs over 60,000 pounds! Manufactured by Clax Italia, just south of Rome, designers used a liquid acrylic pour instead of the usual bead fabrication process so as to achieve maximum clarity. Then they bonded multiple layers and several pieces together to form the entire lens. For the four-hour journey through the narrow streets of Italy to the port city of Livorno for shipping, the lens had to remain in several pieces. Once at the port, engineers built a temporary hangar that functioned like a huge oven as they heated the pieces together into one singular lens. Craftsmen then polished the lens by hand, built a special shipping container for it, and loaded it onto a freighter for the three-week journey to Miami. The total weight of the oculus and shipping container was 80,000 pounds! 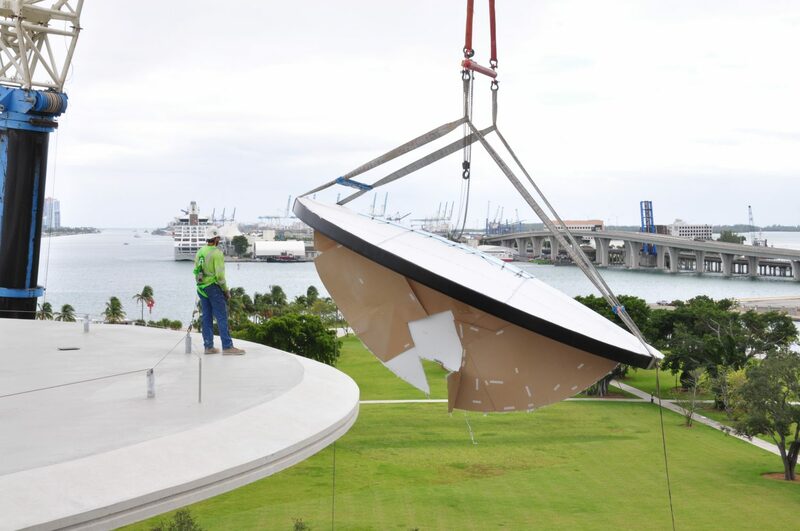 This meant that a unique motorized platform – similar to the ones NASA uses to move space shuttles – had to be used to transport the lens to the museum site in downtown Miami’s Museum Park. How is a gigantic irreplaceable lens actually put into place? Very carefully. And with an enormous crane big enough to lift the oculus over 100 feet in the air. Next up, the Skanska team will start installing the silicone sealant that forms the final seal between the oculus and the fiber glass liner. Finally, they’ll fill the Gulf Stream Aquarium with seawater.